Valentine’s Day might just be the most polarizing holiday of all. People tend to love it or absolutely hate it. But me, I have absolutely no opinion on it, so I figured, for Valentine’s Day, I might as well get on a mystery bus with mystery strangers and do mystery things. 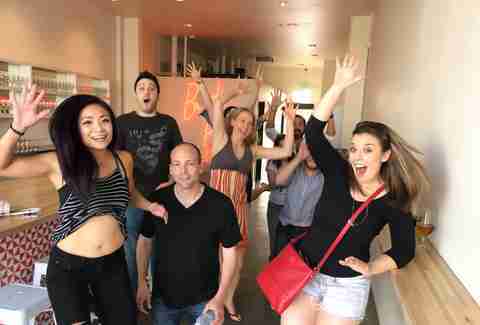 It’s called a Mystery Trip, and it’s by far one of the most creative ideas I’ve ever participated in in LA. Essentially, a Mystery Trip is a fully planned out day that you know nothing about. You buy your ticket, you receive your meeting place, and you show up. Every Mystery Trip is like a snowflake -- a unique experience that never repeats the same activity. All you have to do is show up, and prepare for mysteriousness. Too mysterious for you? Sorry to hear that. Your loss. Our starting point came from an email we received the day before, in which we were instructed to meet at the Daily Dose Cafe at 11AM armed with the following things: a silly hat, three amazing facts about ourselves, our favorite snack, and a DVD we’d be OK never seeing again. My Mystery Trip began when I found my way into a warehouse-type space across from the Daily Dose filled with 30-40 people who all looked as confused as I did. It’s definitely a weird thing to step into a situation of absolutely no control, especially when you’re surrounded by strangers. As we exchanged some awkward hellos, we tried to speculate where on Earth we’d be going and what we’d be doing. Medieval Times? Dave & Buster’s? The Moon? Nobody had any clue, and the stuff we were told to bring didn’t make it any easier to figure out. Soon enough, we met Mysterious Dave, our fearless leader, who started Mystery Tripping as an idea to throw a cool birthday party for his friends eventually turned into his career -- five years later, he’s led more than 150 Mystery Trips. He explained that we’d be setting out for a day full of adventure, surprises, and yep, he definitely used the word mystery. Then, we walked with Dave down the street towards Pour Haus (a wine bar with solid food and an even more solid beer list), and it was time to commence with the mysteries at hand. And from that moment on, we were powerless. Feelin’ fresh from our wine tasting, Mysterious Dave led us outside to a huge, white school bus and we boarded. While snacks were being snacked (jalapeño chips and Sour Patch Kids all damn day) and awkward laughs were being awkwardly laughed, we each put our DVD into a big bag, and the bus cruised towards Pasadena. This sparked a new series of debates: where were we going in the ‘Dena? The Rose Bowl? Gyu-Kaku? Where?!? Between the wine fresh in our stomachs and the bumpy bus, we were able to break even more of the ice as we got to know each other along the ride. When we pulled up in front of a retirement community, we had absolutely no idea where we were. And when Mysterious Dave led us out of the bus, and straight past the retirement community towards a plain white building, none of us expected to see what we saw... which was a huge room filled with vintage pinball machines, AKA Thumperdome. 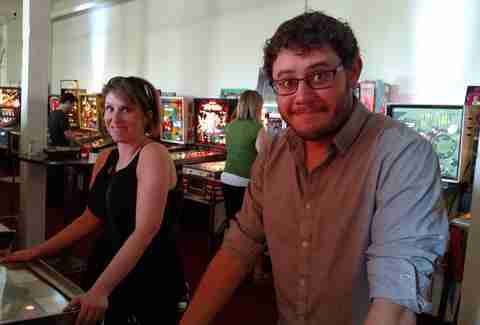 The owners of the space fancy themselves pinball connoisseurs, and Thumperdome is basically a big playable pinball collection. Though it’s not open to the public yet, they were kind enough to let us have at it. They’ve got stuff from old ‘70s Flash Gordon machines to ‘80s KISS machines to ‘90s NBA machines, and it.was.so.damn.fun. Like I said, it’s not open yet, so sorry suckers, but when it does you should go to there. It is fantastic. Though we were a room full of adults, we lit up like kids in a candy store, and only partially because of the bowls of candy that were laid out all over the room. A room full of pinball machines all set to free-play is something that can melt even the coldest of hearts, and before long the room sounded like you were actually inside of a pinball machine, what with all the pinball that was being played. 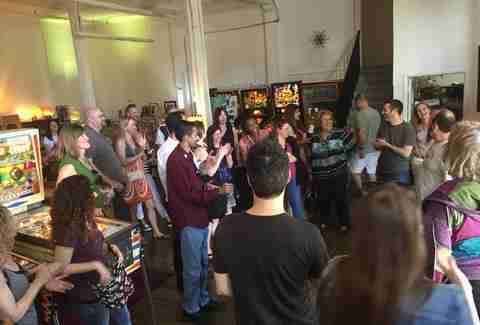 The icing on the cake was surely the old-school jukebox (also set to free-play) where we could gather and get to know each other even more. It’s safe to say that Part Two of the Mystery Trip was nothing anybody expected. Back to the bus with us. As we rode out of Pasadena, we were each given a number. Once again, the speculation was on. We knew we’d be divided into teams, but we had no idea for what. And I think you can guess what group I fell into. An hour later my team had lost the hunt, but we were full of delicious beer from Block Party, so I think we really won when you think about it. By the end of the hunt, however, most of the teams were hanging out at Block Party, each with an ice cold beer in their hands, getting to know each other even more. Did Mysterious Dave get mad that we all wanted to hang out and have some beers? No way. He wanted everybody to hang out together and have fun, and that’s exactly what we did. As we headed home from our day of mystery, it was time to reach into the mysterious DVD bag to acquire our mysterious new DVD. I got Shakespeare in Love, which would have been much more satisfying if the girl right before me didn’t grab Season 3 of The Wire. 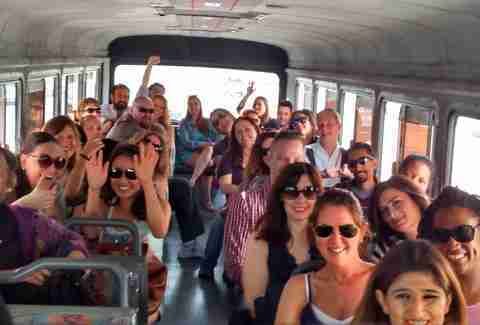 Our Mystery Bus came to its final stop outside of Iron Triangle, so let’s just say that many of us made one more stop of our own. Would I Mystery Trip again? It’s not a mystery that I would. It’s very weird and hard to meet people in your adult life. I’ve always wondered how people make good friends outside of college and work settings. 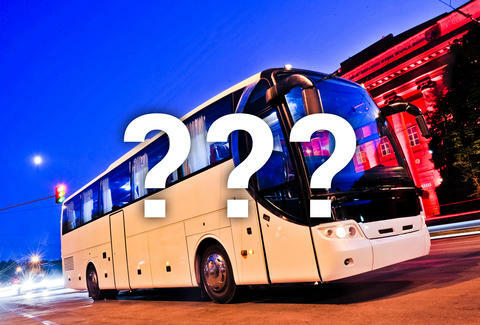 If these are things you’ve also wondered, Mystery Trip is for you. Sure, you’re wedging yourself into a situation you’ve never been in where you have no control, but you’ve also got a ton of people in the exact same boat, ready to take on the challenges at your side. And if that doesn’t work, you can always just get a beer together at Block Party.